Today, I’m pleased to welcome author Pippa Jay to the Paranormal Unbound blog. She’s here to chat about science fiction and sci-fi romance. Plus she’ll give us a look at her latest release Gethyon. One lucky commenter will receive an e-book copy of her science fiction romance short Terms & Conditions Apply and an anthology of SFR stories, Tales from the SFR Brigade. Hi, Pippa! Thanks for being with us today here on Paranormal Unbound. I’m a former analytical chemist, now mum to three red-haired monsters and an author of sci-fi. Whovian, Scaper, and Sith-in-training. Far too addicted to high caffeine coffee, and lost in space – do NOT send a rescue party! LOL! Okay, no rescue party. Duly noted! What do you love about writing science fiction and science fiction romance? My heroes tend to be beta (I’m not a huge fan of the alpha male), often tortured, frequently flawed in some respect, and generally intelligent – at least, smart enough to realize when their heroine doesn’t want them stepping in. I like them to have an honourable streak too, but sometimes they have a darker side. As for my heroines – I prefer them to be strong, but they’re not infallible or invincible. Or perfect. Usually independent and with a tendency to be stubborn. The relationship between them and the hero has to be a meeting of minds more than purely physical. Love those smart, beta men and strong heroines. Now, where do you find inspiration for the worlds you build in your sci-fi stories? Oh, pretty much anywhere and everywhere, but they often start with places I love in my own hometown or surrounding area, or places that I’ve been to. Images from the internet and stock photo sites contribute too. 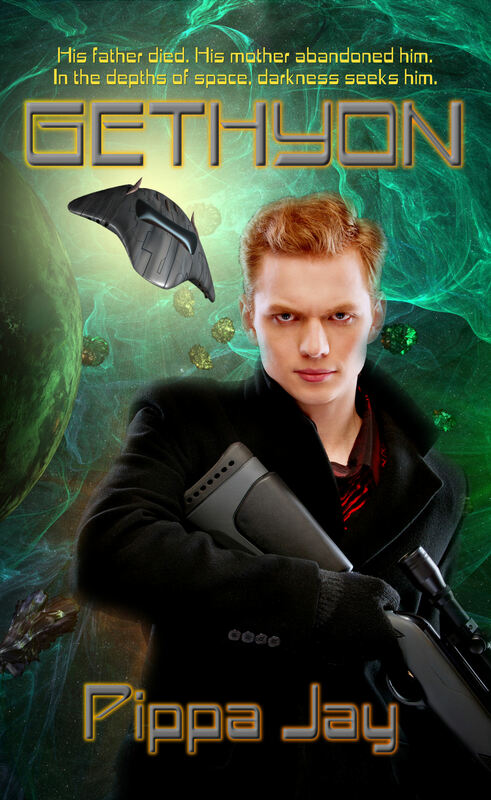 As you know, Pippa, I just love the cover of your sci-fi romance and 2012 SFR Galaxy Award Winner, Keir. How involved were you in the making of Keir’s cover? Does it capture the essence of your novel? Aw, thank you! Well, I filled in the usual cover art form, and I was given the added bonus of being allowed to send in some images too – pictures I’d collected together for Keir himself. But aside from that, I had NO influence at all. When the cover arrived, I have to say I was stunned – it was nothing like I’d expected, and my editor had to push for tattoos to be added, as they were essential to the character. But kudos to the cover artist (Renee Rocco at Lyrical Press, Inc.) who really captured the dark tone of the book and the essence of the character with that cover. I can’t imagine Keir any other way now. You’re a member of the SFR Brigade. Can you tell us a bit about the group? The Science Fiction Romance Brigade is a community of authors, publishers, readers and fans dedicated to writing, reading and promoting, or being involved in the SFR genre. We work together to support each other and to assimilate the rest of the universe into the genre of sci-fi romance, lol. Come join us! I’m sold and thanks for the invite! Okay, let’s get serious now, shall we? Star Trek or Star Wars? Star Wars. Deep Space Nine or Babylon 5? DS9. Battlestar Galactica, original or remake? Er, haven’t seen the remake so I guess original. Loved the Vipers! Stargate SG-1, Stargate Atlantis or Stargate Universe? Oh, dear, again I’ve only seen the first so it has to be SG-1. Farscape or Firefly? Farscape. No contest there! Tell us about your latest release, Gethyon. Gethyon is a YA sci-fi adventure story with spaceships, a sassy bounty hunter, a dark entity and a young hero! A stay-at-home mum of three who spent twelve years working as an Analytical Chemist in a Metals and Minerals laboratory, Pippa Jay bases her stories on a lifetime addiction to science-fiction books and films. Somewhere along the line, a touch of romance crept into her work and refused to leave. Between torturing her characters, she spends the odd free moments trying to learn guitar, indulging in freestyle street dance and drinking high-caffeine coffee. Although happily settled in historical Colchester in the UK with her husband of 20 years, she continues to roam the rest of the Universe in her head. Her works have won a SFR Galaxy Award, and finaled in the Readers Favorite Award Contest and the Gulf Coast RWA Chapter Silken Sands Self-Published Star Award. One commenter will receive an e-book copy of Pippa’s science fiction romance short Terms & Conditions Apply plus an e-book copy of the SFR anthology Tales from the SFR Brigade. Tweet this interview and leave a comment about your tweet to count as the entry. This contest will run until Sunday 7/7 (12 AM Pacific) – Winner will be drawn and announced Sunday! The gods at random.org have spoken! The winner of an e-book copy of Pippa’s science fiction romance short Terms & Conditions Apply plus an e-book copy of the SFR anthology Tales from the SFR Brigade is: BlondieBlack! Disclaimer: Prize must be claimed within one week of the winning announcement. Gethyon cover art by Misa Buckley. Copyright Champagne Book Group, all rights reserved. Keir cover art by Renee Rocco. Copyright Lyrical Press, Inc, all rights reserved. Both covers used here with permission of author. Tags: Gethyon, Keir, Pippa Jay, romance, science fiction, science fiction romance, SFR Brigade, YA sci-fi. Bookmark the permalink. Previous post ← We want to meet you at #RWA13! Enjoyed the interview very much. Already read most of the anthology which is a great collection of stories. Would love to win a copy of Terms and Conditions. Thanks for the giveaways! My pleasure! Thanks for bringing the sci-fi goodness to Paranormal Unbound! I quite like sci-fi romance tho I’ve not read many in that genre lately. I particularly enjoy Linnea Sinclair’s books. I haven’t read any Sci-fi romance but would like to try it. I enjoy Sci-Fi romance too… I’m a huge fan of The Doctor, Star Trek, Star Wars, … I’ve enjoyed books by Orwell. For a while I was reading everything I could find in the Star Wars genre. I”ve also enjoyed books by Brian Kayser, and Aubrie Dionne… Thanks for the giveaway! Snap, Celia. Loved Tennant, especially paired up with Donna Noble. Thanks, AJ! Ah, I miss doing the lab work – and you’re dead right about it keeping the brain active. BlondieBlack, you won the giveaway, congrats!